Are you wondering how you can get your rough and scratchy beard to a smooth and fuller one? If you’re looking for the perfect beard, you must first understand the causes behind your rough beard. Like any problem, you need to first understand the root cause of the issue before you can solve it. There are two common reasons why a beard is rough… and the good news is each cause has an easy and correctible solution. Just like with your hair, if it’s dry then it will be rough. 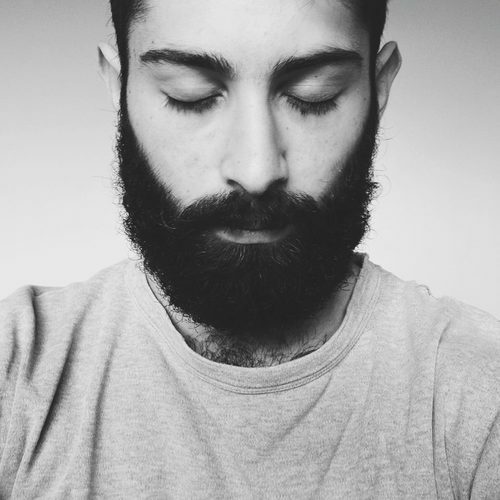 When caring for your beard, you need to ensure your hair follicles, like hair, is properly moisturized and does not become dry. A beard is made up of hair follicles. And just like with your hair, split ends and knots can cause you to have rough and itchy hair. The same applies to your beard. You need an effective solution to split ends and knots if you are going to obtain a full, softer and more welcoming beard. Now that you have an understanding of the causes of your rough and dry beard, we’ll take a look at some solutions which will set you on the path to a handsome beard. The two primary items you’ll need in obtaining a soft and full beard is beard oil and beard balm. Beard oil is easy to apply and you should start using it once your beard is 10 days old. Beard oil will increase the softness of your beard, reduce beard itch and beard-ruff, provide nourishment to your hair and skin, obtain fullness and shine to your beard, and provide an amazing scent to your beard. It will leave your beard with a shiny, oily look. Beard balm, on the other hand, includes all the essential items that beard oil does but has the addition of beeswax. It’s a great option for a matte finish to your beard if you want to reduce the shine of beard oil. It provides conditioning benefits, typically to larger beards that are a few weeks old, but can be used in smaller beards. In addition to the benefits beard oil provide, beard balm will also provide you the ability to style and control your beard hair follicles. Styling and control of your beard is essential when you’re trying to prevent split ends and knots. Your first step is to choose a high-quality beard oil and beard balm. You’ll need both so do your research into which ones have the highest ratings and effectiveness. Additionally, get recommendations from friends and others who have beard or have had them in the past. Just like a great shampoo and conditioner, the choice of beard oil and beard balm is essential in gaining your desired results. Once you’ve obtained your beard balm and beard oil, you’ll need to begin a morning and nightly routine to get your beard under control. Wash your face with warm water each morning to open up pores. Next, add a few drops of beard oil in your hand and massage it into your beard. Use your hands and fingers to comb the beard oil throughout your entire massaging process. Make sure you go all the way down to your skin. The use of beard oil adds moisture to your beard and this in turn attacks the dryness of your beard follicles. At night, take a shower before exfoliating the skin beneath your beard. In order to save money from purchasing an expensive beard brush, you’ll need to have a wide, soft bristle toothbrush to assist in this process. Use the toothbrush to very gently scrub below your beard in the shower. The gentle scrubbing does a variety of beneficial things such as loosening dead skin cells and preventing breakouts, giving your beard a warm and polished look while smoothing out the beard hair follicles. This is a great time to use a gentle skin cleanser on your face and beard area as well. After exfoliating, place some beard balm on your hand and rub it between both your palms in order to heat it and make it easier to work with. You need to make sure you have an even spread of balm in both hands. Work the balm through your entire beard: begin at the roots and work it through to the end of the follicles. The primary purpose of beard balm is to address the knots and split ends. If you continue this process for a minimum of 14 days, you’ll begin to notice your beard becoming softer and more inviting to your partner. Additionally, you’ll begin to have less beard itch for yourself. Apply preshave oil daily, even if you’re not planning to shave. Preshave oil coats every single hair and provides extra moisture. Avoid all alcohol-based products when searching for beard products. In addition, do not use products that are primarily made with castor oil as it will cause your beard to be very sticky. Condition your beard – Just as your hair needs occasional conditioning, so does your beard. When choosing a beard conditioner, you may want to choose a natural oil-based conditioner. Hydrate your body – By drinking an adequate amount of water, preferably 8 glasses per day, you’re not only rehydrating your body but giving it enough water content to provide additional moisture for your skin on your face and beard area. No matter the size of your beard or your purpose for wanting to grow one, it’s essential for you to understand having a soft and full beard that looks great and smells great requires lots of work. Before deciding to grow a beard, you need to consider the work that goes into up-keeping it. If you’re willing to put in the work, then you’ll reap the rewards.